Aptamil first milk is a whole based infant milk for babies suitable from 0-12 months. 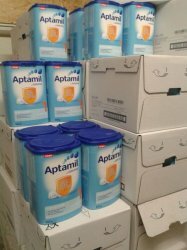 We are direct exporter of high quality healthy aptamil milk powder for babies.best prices and fast delivery. Original baby milk powder from mulipa Germany .Our Products are 100% original sealed in a box. Aptamil baby milk powder - formula Pre,1-2-3 and plus. Milupa aptamil growing up milk will help you to ensure your toddler receives all the nutrient they require as they grow up. Aptamil has led the way in the understanding of infant over 50 years. 1) Research has shown that the inclusion of GOS/FOS prebiotics in an infant formula during the first six months of feeding can reduce the incidence of allergic manifestations and infections up to 2 years of age. GOS/FOS prebiotics consistently encourage the growth of friendly bacteria at the expense of potentially harmful bacteria. 2) Babies bottlefed a formula containing GOS/FOS prebiotics also have softer stools. 3) LCPs are important in the development of a baby’s brain, cognitive behaviour and vision. 4) Bottlefed babies who are fed nucleotides have an improved antibody response compared to those not receiving nucleotides.Contact us for your demand and one of our costumer service team personel will get to you ASAP.Looking forward in hearing from you.